One of the challenges in sewing for men is that patterns for them are harder to find. So today I want to talk about where to find men’s sewing patterns. 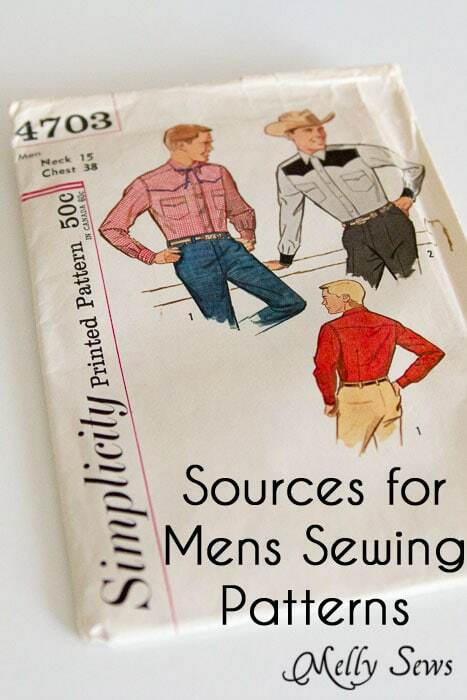 Vintage patterns found at thrift stores, garage sales, Etsy and eBay are the most plentiful source of men’s patterns. I got this one for $1 at a thrift shop. 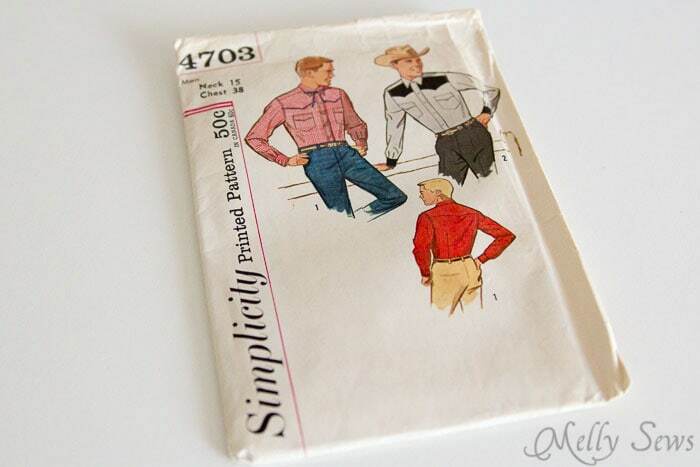 The good news is that men’s styles are usually variations on a few basic shapes, so this can be a frugal way to find sewing patterns for them. The cons are that you may end up missing a piece or more, and the instructions are sometimes harder to follow. The Big 4 pattern companies (McCall’s, Butterick, Vogue and Simplicity) all have men’s patterns. Of those 4, Vogue seems to carry the biggest variety. They are pretty much all basic shapes (again, the nature of menswear), and if you’ve ever sewn a Big 4 pattern, you know the sizing/fit/thin tissue paper issues that they can have. I personally grew up sewing with Big 4 patterns, so I like them, with the caveats that I usually don’t follow the instructions or base my sizing on anything but my own measurements of the actual pattern pieces. The BurdaStyle website has quite a few menswear patterns available in PDF format. The caveat would be that if you’ve ever sewn from a BurdaStyle pattern, you know that the instructions are minimal with pretty much no images and patterns typically don’t include seam allowances. So proceed with caution, but you can find their full selection here. Colette Patterns, which has had several very popular women’s patterns over the years, has recently branched into men’s patterns. There are only three, but they look high quality and I know they’re more detailed than big 4 patterns as far as instructions go. 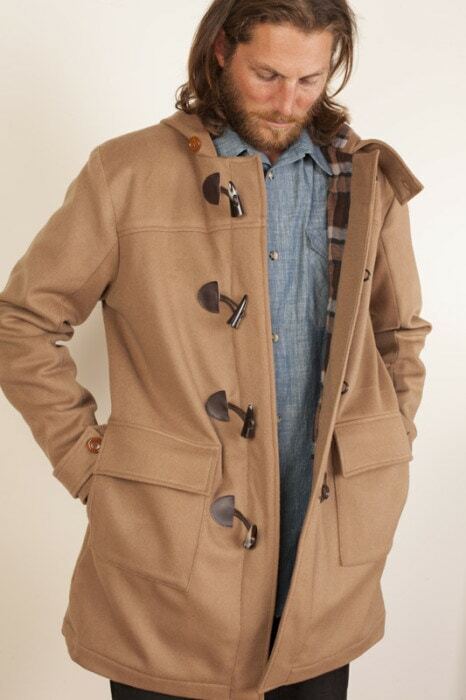 Their Albion Jacket is pictured below, worn over a Negroni shirt. Also nice – you can get the patterns in both paper and PDF form. See them here. 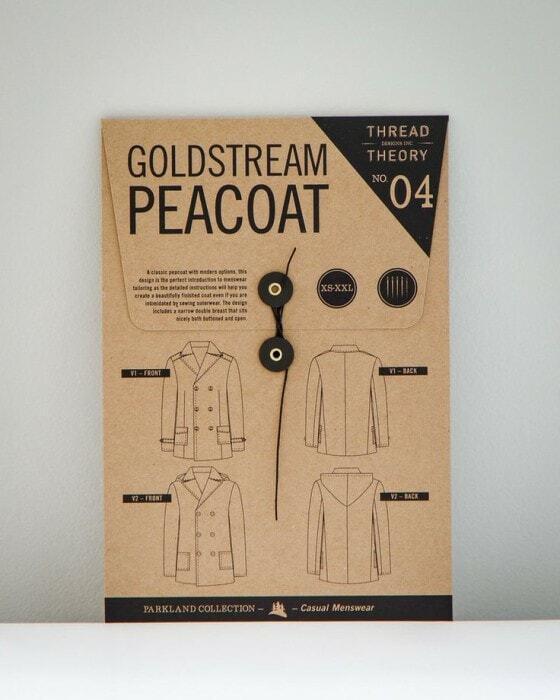 Thread Theory is a new pattern company that does JUST patterns for men. They’re out of Canada, and they have some younger and modern designs. I haven’t sewn any of them, but they look pretty thorough, and they have a blog where they’ve done sewalongs as well. They also offer patterns in both paper and PDF form, so that’s cool too. So there you go – a few sources for you to check out if you’d like to sew for your guy. Or yourself, if you happen to be a guy. Come back tomorrow to check out my next men’s tutorial. I sewed up a couple of Thread Theory patterns and they are great patterns!!! Well worth it! I also recently subscribed to Seamwork Magazine. Last month’s issue was dedicated to men’s wear & it was neat! There’s a great vest pattern & sweater that I plan to attempt. It’s tough to find good patterns for men. This is a great post & I appreciate your recommendations!